Each week, Paul Solman gets dozens of questions from the audience, ranging from whether one should refinance a mortgage, if Stephen Colbert is coming after his job to where he buys his signature hats. Generally, we post a few of his answers a week on his Making Sen$e page, along with updates on upcoming broadcast stories, what’s happening in the news, or things we think are just great — and unique — at explaining what’s going on in the financial world. 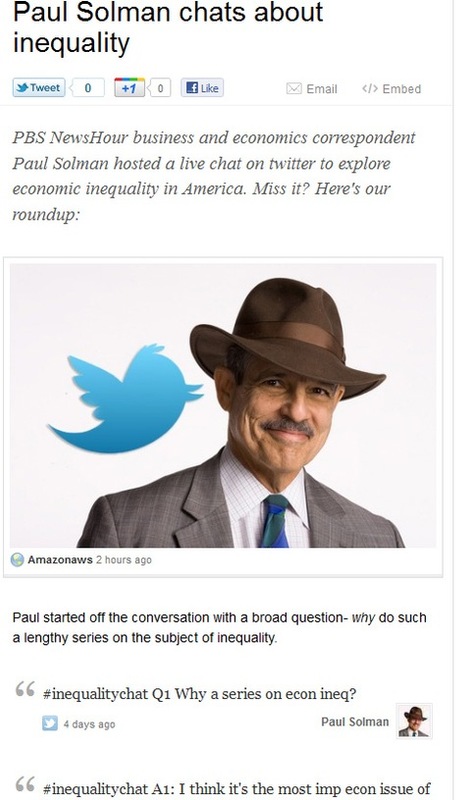 Last Friday, Paul took to the social media sphere for an hour-long live Q&A session on a topic that’s sparked quite a healthy debate on our pages: economic inequality. You can see it all here, but we’ve rounded up and ordered the two-dozen queries and responses below, along with some additional information and reporting. We’re continuing our series on inequality, so if you have a story idea, comment or question, please add it in the Disqus section below, or Ask Paul a Question.